Century old rustic and romantic Cedar Cabin offers all you need for memorable mountain get-away! Wonderful winter Discounts. Peak season is May - Nov 1st for double occupancy 'mid week days @$145. Fri Sat Sun and Mon @$175. Rates noted are for one King bed on main floor for single or double occupancy. This cabin has 3 bedrooms, 2 are in attic loft with LOW ceilings and a 'shared toilet- sink bathroom between the 2 bedrooms, being a tiny 'Jack'nJill powder room' (with toilet and tiny sink only). Ok for kids, but has steep steps to upper attic space for added sleepers (great for kids, not toddlers). Maximum guests in cabin allows up to 5. Weekly guests enjoy a free breakfast casserole on one of your stay days so, pick one of our 'Breakfast Casseroles' freshly baked, and delivered to your door-step. No need to come to door as I'll text when Im dropping off to your cabin so you can 'pull inside' or 'heat 'n eat when time is right for you! 3. 'Creamy, buttery Grits'n greens baked with jumbo bites of beer-battered fried shrimp topped w/melted sharp cheddar and crunchy onions. A Classic Southern Favorite! The Mountains offer Plenty of fun outdoor activity. Hiking Trails, Waterfalls all within a half hour or so from your cabin. Snow Board and Skiing in winter. White Water Rafting, Boat Rentals for Fishing, Water Skiing, and site-seeing! There's Golfing in any of the areas famous resorts, Antique Stores, Country and Gourmet' Restaurants, Horse Back Riding, The Famous Biltmore House in Asheville, popular Hendersonville, The Cherokee Casino, Highlands, and Sapphire all within an hour or so away! 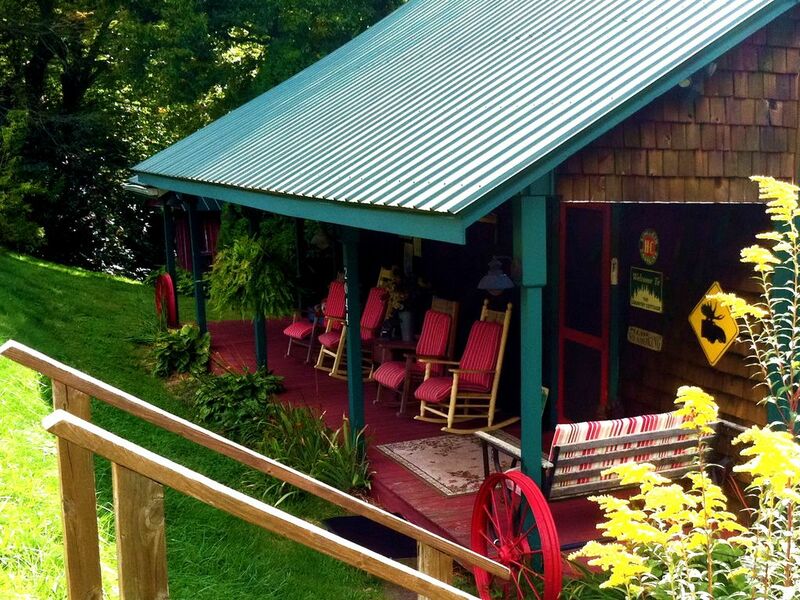 Rest'n Relax at your Rustic Creek-side Cabin w/Hot Spa. A 100 year old cedar cabin on spacious grounds! Hot Spa pleasure couldn't be better while listening to your creek and star gazing! This is simple 'All Season Cabin' for Fun Anytime time of the year! E-mail for 'Availability ' since calendar and rates may need updating. Why pay 'on the lake rates' when you're just 1 mile from the Beautiful Glenville Lake, highest Lake east of the Mississippi. and just 5 miles to downtown Cashiers! Cedar cabin has easy access with a country cottage theme, your own personal Hot Tub, Hammock, Fire-pit (small fee per bundle upon your request), outdoor fun and much more. Double occupancy offers for lowest rate (if no need of upper area) Double occupancy' use main floor with master bedroom offering King bed. This modest rustic 100 year old homestead is all wood, inside and out. A/C in summer to stay nice'n cool on those very few hot days since its valley location brings refreshing breezes to you! On those chilly mountain nights warm your toes as you enjoy the sound of crackling' wood in your outside fire-bowl. Rockers on your covered front porch and a spacious open back deck with patio and bar stools next to your 'Hot Tub' to enjoy at night while star gazing, or by day listening to the babblin' brook just beside you. The country kitchen, parlor and bathroom are all on the main floor. Working couple loving mountain life and eager to please guests as they enjoy the serenity here in Western NC. Simplicity is key and we strive to maintain such! This 100 yr old Rustic Cedar Cabin was an original homestead of a local family here where they raised a hard working family. The creek, spacious grounds and surrounding views offer guests a relaxing vacation with the lake just 1 mile from cabin. Downtown Cashiers just 5 minutes away. Spacious grounds for your enjoyment. Upper area upon request to open upper bedroom has half bathroom shared as 'Jack'n Jill accessible between both upper bedrooms with toilet and small sink only. Inform me IF you want to Bring your own bed linens and towels so I'll deduct rate. What a great place to stay for a mini vacation. The hot tub was always hot and working. The house is nice and cosy. Very private and peaceful. The host are awesome people. I would stay there again. What a charming, quaint, comfortable cottage that makes you forget, time and reality!! Very memorable stay, quiet except for the soothing babbling brook!! We really enjoyed our mountain get away; the hosts were extremely amenable, the cabin was cozy, and it was a lovely, quiet area. They had any kind of kitchen implement you can think of; we made a roast in the crock pot that lasted almost our whole visit. Very nice cabin. Chris and Jim are excellent hosts. Our trip was cut short due to 18 inches of unexpected snow. We very much enjoyed the time we were there. Chris kept us updated on weather and conditions. Jim plowed the snow away from the driveway so we could leave. The cabin has been restored in a very artistic manner. It has the real feel of a country cabin but with modern amenities. We did take advantage of the hot tub and it was great. Overall this was a five star experience. It is a charming and comfortable place. Easy to get to with a really nice view from the dining room table. So relaxing with the sound of brook just outside the house. Also the owners were great! Convenient location, Just 5 miles from downtown Cashiers, century-old Creek-side cedar cabin with your own personal Hot Tub on deck is located 1 mile from beautiful Lake Glenville!! Easy access location next to a very quiet country road by Bee Tree Creek. Watch bicyclists ride by as you sip your morning coffee each spring during the famous 'Tour'de Cashiers' as picture here shows. PEAK Season (May1-Nov 1st) 'Mid-week' rate mid-wk from $145 IF 'double occ' (meaning 2 guests in one bed) unless 'last minute special'. Holiday and Special events have higher fee starting at $175 per night (double occ) with a 3 night minimum unless last minute availability, plus cleaning fee, tax and sec fee. Weekly Rate varies and 6 nights / 7 days. Add $25 per each additional guest or bedroom (in upper area)/ per night. Please mention such upon inquiry. Cleaning fee from $78 - $98 (pending bedrooms used). $75-$100 sec fee. Pet fee varies and requires pre-approval. --- Rates are subject to Change so book early!